Summary: Jeanne Drisko, MD, was named last summer to the Hugh D. Riordan Professorship in Orthomolecular Medicine at the University of Kansas Medical Center. The endowed professorship is the first of its kind in the United States. The chair honors Drisko's mentor, a long-time leader in the orthomolecular field. Interesting, for a field which was originally able to flourish because of its distance from academic medicine. The term orthomolecular, coined in 1968 by two-time Nobel laureate Linus Pauling for a paper her published in Science magazine, means "right molecule." The aim of orthomolecular medicine is to prevent disease and restore health by providing the body with optimal amounts of natural substances. The emerging field proved a profound influencer in the development of functional medicine, modern naturopathic medical practice, clinical nutrition and environmental medicine. Now, nearly 40 years later, Pauling's concept has arrived in academic medicine with the nation's first endowed professorship. 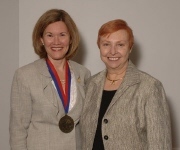 In a ceremony last summer, Jeanne Drisko, MD, was named to the Hugh D. Riordan Professorship in Orthomolecular Medicine at the University of Kansas Medical Center (UKMC). Riordan, who died last year, was Drisko's mentor. He was a long-time leader of the International Society of Orthomolecular Medicine (ISOM) for which he served as the associate editor of its Journal of Orthomolecular Medicine. The professorship was endowed through a combination of sources including family and a group of foundations. Barbara Atkinson, MD, vice chancellor of the UKMC, honored Drisko in the ceremony: "Dr. Drisko has exemplified herself through outstanding work as a researcher and educator. She has earned the distinction that this professorship represents." Drisko developed the UKMC Program in Integative Medicine, which she founded in 1998. Drisko's work include an unusual integrative clinic in which she teams with a licensed naturopathic physician in a program which offers a style of care taught through the Institute for Functional Medicine. Drisko's program is a member of the Consortium of Academic Health Centers for Integrative Medicine. Drisko, a principal investigator on a number of research projects, has also distinguished herself for her education and policy work. The UKMC release announcing the professorship noted that Drisko "has worked closely with Kansas legislators, the Kansas Board of Healing Arts, and the Kansas Medical Society to develop and pass laws and to define policy in the area of complementary and alternative medicine." Drisko also served on the Institute of Medicine committee which produced the report on Complementary and Alternative Medicine in the United States. Comment: I first came across Drisko's work in early 2005 while researching distinctive multi-disciplinary relationships in conventional academic health centers for the National Education Dialogue ot Advance Integrated Health Care. I learned that, there in Kansas, Drisko had not only credentialed a naturopathic physician as her partner in her academically-based integrative center - a rarity - but she had also played a leading role in securing the naturopathic licensing statute in her state - even more rare. When I asked her how she accomplished all this in Kansas, of all places, Drisko merely shared that some had "drawn a circle that excluded me, so I just drew a bigger one that included them." Significant pioneering. Congratulations, Dr. Drisko! Hoffer's own ignorance of psychiatry, which he credits for allowing him to take on challenges without being bound by academic teaching which would have ingrained in him that the conditions with which he was working were "incurable." "No medical school. No one to tell us what we could or could not do." No committees on research which would restrict what they could do. The original orthomolecular explorations a half century ago, apparently made possible in part by the explorers' distance from academic medicine, have led, today, to the creation of an academic medical home, in 2006, at Drisko's endowed position at University of Kansas Medical Center. This is either a sign of uptake into our culture - or maybe there is a Saskatchewan-Kansas connection that explains this.